So I’m a bit obsessed with bangle bracelets. As far as accessorizing goes these days it’s pretty much all bracelets or bangles or watches all of the time. Last year I accidentally lost my favorite pendant that Rob gave to me and I feel terribly about it. He’s since replaced it with a new necklace, because he’s just sweet like that. After his art show he hands me a package and shows me the lapis lazuli he got me to replace the one I lost. After HIS art show. HIS big day. He just happened to see that they sold the work of a jewelry artist and so he got me one! But I’ve gotten sidetracked. 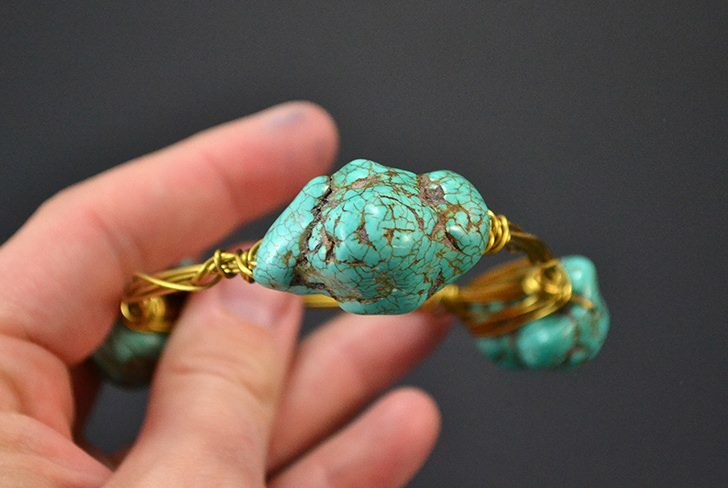 I recently bought a gorgeous wire wrapped bangle off of the internet with peach druzy as the stones and I love it. I didn’t quite realize it was peach, instead thinking I saw pink so it doesn’t really match much of what I wear. But I’ve worn it anyway because I like it so much. When I considered buying a few more so that I can stack them as they look so good when a bunch are worn together, I realized that I didn’t want to spend that much money . So rather than buy up a whole bunch of them I decided to try and make my own. Now I have NO experience with wire wrapping so this was totally new for me BUT I’m pretty happy with my first attempts. My very first wound up looking so much neater/cleaner than the second and you would have thought practice would make perfect! But I still have the beads and as I get better I can snip them off and try again with fresh wire. But for now, I’m pretty dang happy with them! I guess I love these so much because they put an emphasis on the beads. 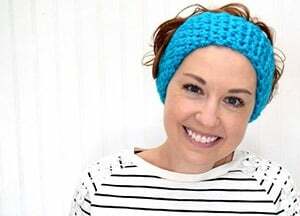 And that’s pretty awesome since I have a bunch of bigger/awesome beads I’ve been snapping up over the years but never actually knew how to use them. I mean, I made some chunky beaded bracelets but they wound up being heavy or I just didn’t like them. 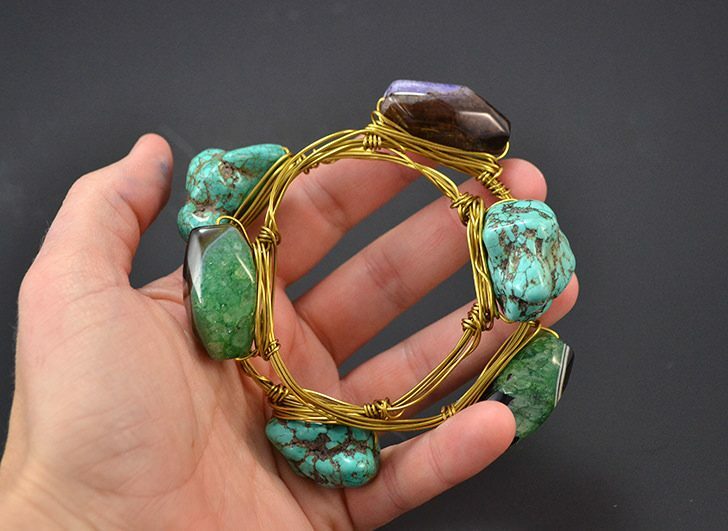 These wire wrapped bangles, though, I just love. Now since this is my first wire wrapping go I can’t show you how to do this. 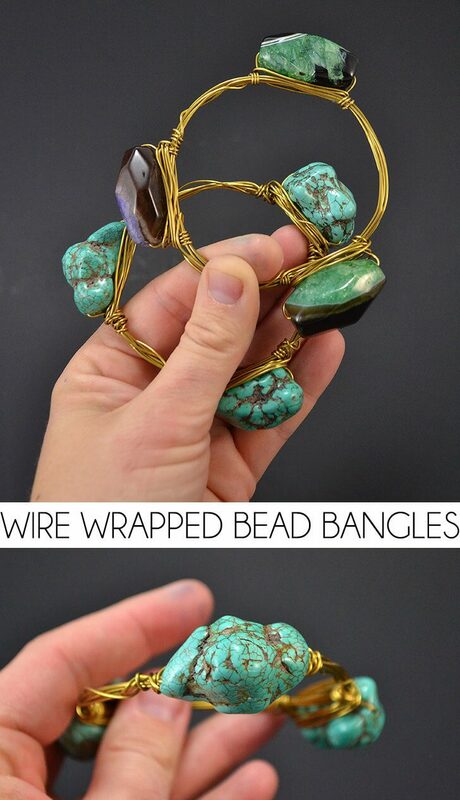 Luckily I got my instruction off of an AWESOME video from YouTube so check that out and make your own wire wrapped bead bangles. It’s super easy, guys!